The contributors list includes a number of distinguished and internationally renowned crime writers, such as John Connolly, Tana French, John Banville and Alex Barclay, featuring rare and unpublished pieces. Is crime fiction now the most relevant and valid form of writing to deal with Modern Ireland in terms of the post-'Troubles' landscape and the post-Celtic Tiger economic boom? 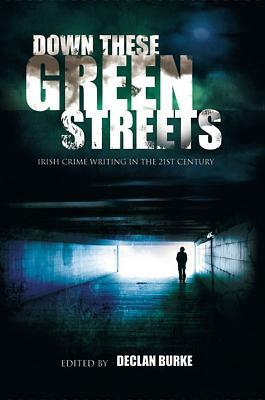 As the first book written on this topic, Down These Green Streets is both detailed and diverse, with each chapter providing a new author's approach and discussing a different aspect of Irish Crime Writing. For example, Declan Hughes focuses on the influence of American culture on Irish crime writing, while Tana French reflects on crime fiction and the post-Celtic Tiger Irish identity. Down These Green Streets is for both the academic and the general reader. List of Contributors in Alphabetical Order: Adrian McKinty, Alan Glynn, Alex Barclay, Andrew Nugent, Arlene Hunt, Brian McGilloway, Colin Bateman, Cora Harrison, Cormac Millar, Declan Hughes, Eoin McNamee, Gene Kerrigan, Gerard Brennan, Gerry O'Carroll, Ingrid Black, Jane Casey, John Banville, John Connolly, Ken Bruen, Kevin McCarthy Neville Thompson, Niamh O'Connor, Paul Charles, Ruth Dudley Edwards, Sara Keating, Stuart Neville, Tana French and Tara Brady.